Members of the American Association for the Advancement of Science are wrestling with how to push back when presidential actions are not in the interest of science. On Sunday, as the group met in Boston, several hundred scientists joined a “Stand Up for Science” rally just down the street in Copley Square. The nation’s biggest general scientific society convened its annual gathering this weekend, and quickly became preoccupied by the political challenge to science posed by the month-old Trump administration. In both formal talks and side activities, researchers and other members of the American Association for the Advancement of Science pondered what factors led to Donald Trump’s electoral victory, what it would mean for their jobs, and what if anything they should do to push back. The anxiety was evident even in the hallways of the AAAS conclave, where one session on “Defending Science and Scientific Integrity in the Age of Trump” left a thick line of disappointed attendees unable to squeeze into the conference room. Inside, John P. Holdren, the chief White House science adviser throughout the Obama administration, urged researchers to get more politically active. “Don’t be discouraged or intimidated” by the Trump presidency, said Mr. Holdren, who has returned to his job as a professor of environmental policy at Harvard University. His wariness reflected a list of actions and comments by President Trump that scientists see as threatening them and their work. Those actions include Mr. Trump’s threats to expel foreigners, whom scientists see as major contributors to the nation’s intellectual strength; his appointment of administration officials who have rejected scientific understanding of the climate and the environment; and his own statements questioning established medical positions, such as the safety of vaccines. The prospect of needing to engage more deeply in the nation’s political drama has left many scientists uneasy. A key question concerns the March for Science, set for April 22 in Washington and other U.S. cities. The AAAS is among the scientific groups still weighing how to approach the planned protest, concerned both by the Trump administration and by the risk of making scientists appear as just another political special interest. 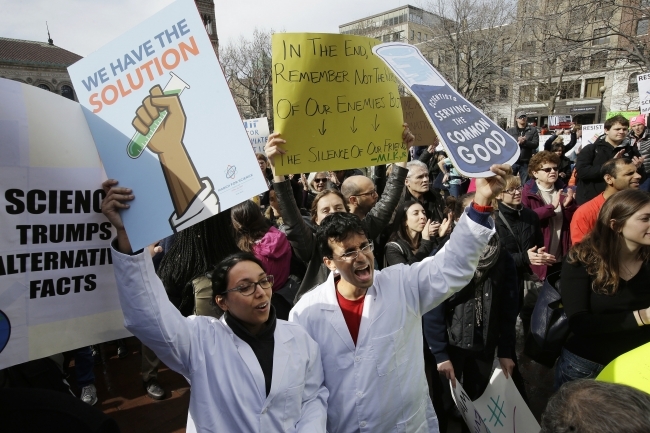 The message that Americans ultimately get from the April demonstration may be unknowable for scientists until the day it occurs, Mr. Holdren warned his colleagues, when people hear the specific words spoken from the podium and see the signs held by the crowd. The AAAS conference also had sessions aimed at solutions. They included panels of researchers studying the effects of computer automation on job losses, which some researchers see as a key factor in the economic anxieties that helped fuel Mr. Trump’s candidacy. But the solutions they identified were more political than technical, such as figuring ways of better distributing the economic rewards that flow to society from the automation. And as AAAS members have been told repeatedly at past conferences, better communications skills could help. Bart Gordon, a former Democratic member of Congress from Tennessee who served as chairman of the House science committee, told one panel that he understands the threat posed by climate change but never used that term in public discussions. Instead, said Mr. Gordon, who is now a partner at the Washington law firm K&L Gates, he takes care to describe for people the need to pursue “energy independence.” Such advice reflects the well-known propensity for people to reject facts that don’t comport with their political views. As such, scientists were repeatedly warned during the conference that they can’t expect to change minds simply by restating those facts. That point was emphasized in the conference’s final keynote address by S. James Gates Jr., a professor of physics at the University of Maryland who served in the Obama administration as a member of the President’s Council of Advisors on Science and Technology. Mr. Gates said he’s been embarrassed by colleagues who go to Capitol Hill seeking funding for research and behave as supplicants, assuming little need to consider competing political priorities. Among the wider public, he said, scientists are regarded as Sheldon Lee Cooper, the stereotypical nerd university physicist in the television program Big Bang Theory, who is highly intelligent but demonstrates no empathy or tolerance for others.